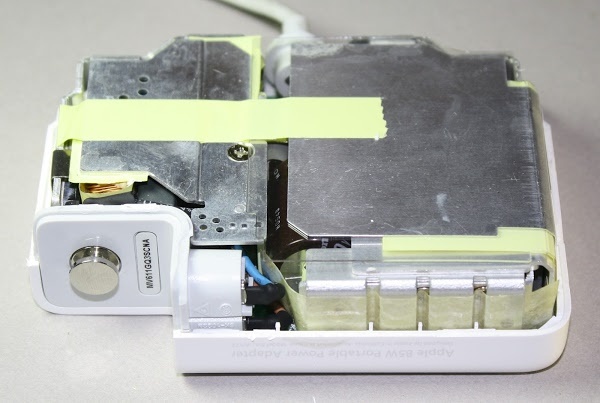 Have you ever wondered what's inside your Macbook's charger? There's a lot more circuitry crammed into the compact power adapter than you'd expect, including a microprocessor. This charger teardown looks at the numerous components in the charger and explains how they work together to power your laptop. Inside the Macbook charger. Many electronic components work together to provide smooth power to your laptop. Most consumer electronics, from your cell phone to your television, use a switching power supply to convert AC power from the wall to the low-voltage DC used by electronic circuits. The switching power supply gets its name because it switches power on and off thousands of times a second, which turns out to be a very efficient way to do this conversion. Switching power supplies are now very cheap, but this wasn't always the case. In the 1950s, switching power supplies were complex and expensive, used in aerospace and satellite applications that needed small, lightweight power supplies. By the early 1970s, new high-voltage transistors and other technology improvements made switching power supplies much cheaper and they became widely used in computers. The introduction of a single-chip power supply controller in 1976 made switching power supplies simpler, smaller, and cheaper. "That switching power supply was as revolutionary as the Apple II logic board was. Rod doesn't get a lot of credit for this in the history books but he should. Every computer now uses switching power supplies, and they all rip off Rod Holt's design." This is a fantastic quote, but unfortunately it is entirely false. The switching power supply revolution happened before Apple came along, Apple's design was similar to earlier power supplies and other computers don't use Rod Holt's design. Nevertheless, Apple has extensively used switching power supplies and pushes the limits of charger design with their compact, stylish and advanced chargers. For the teardown I started with a Macbook 85W power supply, model A1172, which is small enough to hold in your palm. The picture below shows several features that can help distinguish the charger from counterfeits: the Apple logo in the case, the metal (not plastic) ground pin on the right, and the serial number next to the ground pin. Strange as it seems, the best technique I've found for opening a charger is to pound on a wood chisel all around the seam to crack it open. With the case opened, the metal heat sinks of the charger are visible. The heat sinks help cool the high-power semiconductors inside the charger. The other side of the charger shows the circuit board, with the power output at the bottom. Some of the tiny components are visible, but most of the circuitry is covered by the metal heat sink, held in place by yellow insulating tape. The circuit board inside the Apple 85W Macbook charger. At the right, screws firmly attach components to the heat sinks. After removing the metal heat sinks, the components of the charger are visible. These metal pieces give the charger a substantial heft, more than you'd expect from a small unit. Exploded view of the Apple 85W charger, showing the extensive metal heat sinks. The diagram below labels the main components of the charger. AC power enters the charger and is converted to DC. The PFC circuit (Power Factor Correction) improves efficiency by ensuring the load on the AC line is steady. The primary chops up the high-voltage DC from the PFC circuit and feeds it into the transformer. Finally, the secondary receives low-voltage power from the transformer and outputs smooth DC to the laptop. The next few sections discuss these circuits in more detail, so follow along with the diagram below. The components inside an Apple Macbook 85W power supply. The input components in a Macbook charger. The diode bridge rectifier is attached to the metal heat sink with a clip. 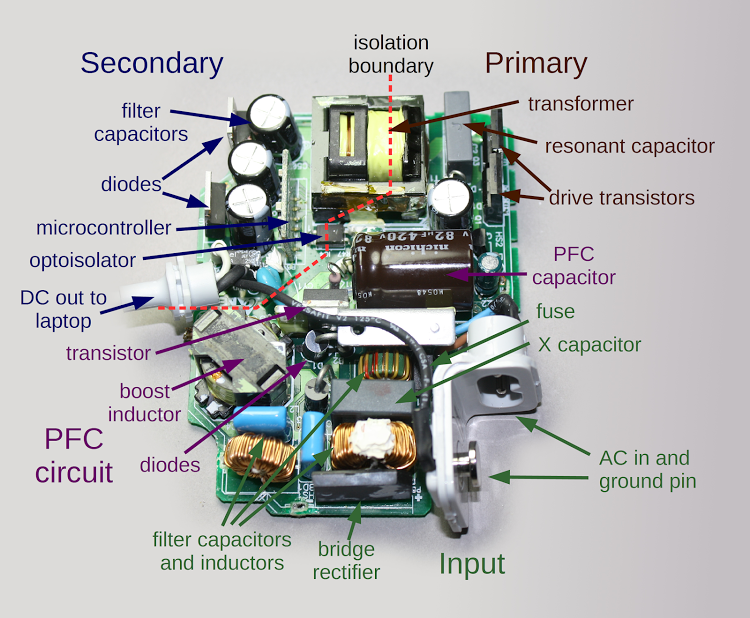 The next step in the charger's operation is the Power Factor Correction circuit (PFC), labeled in purple. One problem with simple chargers is they only draw power during a small part of the AC cycle. If too many devices do this, it causes problems for the power company. Regulations require larger chargers to use a technique called power factor correction so they use power more evenly. The PFC circuit uses a power transistor to precisely chop up the input AC tens of thousands of times a second; contrary to what you might expect, this makes the load on the AC line smoother. Two of the largest components in the charger are the inductor and PFC capacitor that help boost the voltage to about 380 volts DC. The primary circuit is the heart of the charger. It takes the high voltage DC from the PFC circuit, chops it up and feeds it into the transformer to generate the charger's low-voltage output (16.5-18.5 volts). The charger uses an advanced design called a resonant controller, which lets the system operate at a very high frequency, up to 500 kilohertz. The higher frequency permits smaller components to be used for a more compact charger. The chip below controls the switching power supply. The circuit board inside the Macbook charger. The chip in the middle controls the switching power supply circuit. The two drive transistors (in the overview diagram) alternately switch on and off to chop up the input voltage. The transformer and capacitor resonate at this frequency, smoothing the chopped-up input into a sine wave. The secondary side of the circuit generates the output of the charger. The secondary receives power from the transformer and converts it DC with diodes. The filter capacitors smooth out the power, which leaves the charger through the output cable. The most important role of the secondary is to keep the dangerous high voltages in the rest of the charger away from the output, to avoid potentially fatal shocks. The isolation boundary marked in red on the earlier diagram indicates the separation between the high-voltage primary and the low-voltage secondary. The two sides are separated by a distance of about 6 mm, and only special components can cross this boundary. The transformer safely transmits power between the primary and the secondary by using magnetic fields instead of a direct electrical connection. The coils of wire inside the transformer are triple-insulated for safety. 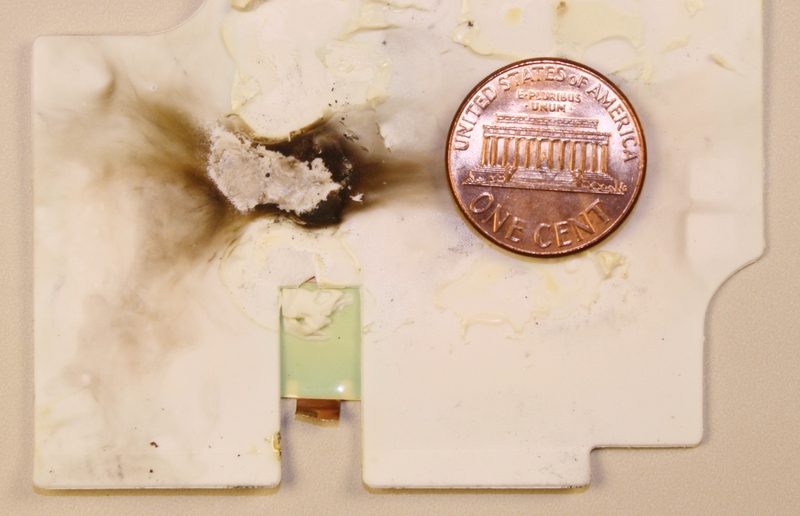 Cheap counterfeit chargers usually skimp on the insulation, posing a safety hazard. The optoisolator uses an internal beam of light to transmit a feedback signal between the secondary and primary. The control chip on the primary side uses this feedback signal to adjust the switching frequency to keep the output voltage stable. The output components in an Apple Macbook charger.The two power diodes are in front on the left. Behind them are three cylindrical filter capacitors.The microcontroller board is visible behind the capacitors. A powerful microprocessor in your charger? 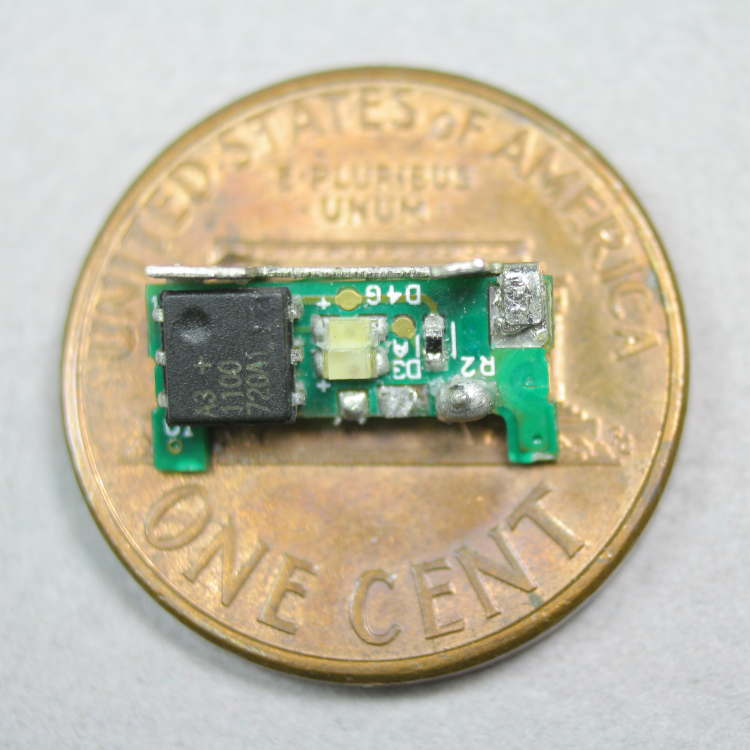 One unexpected component is a tiny circuit board with a microcontroller, which can be seen above. This 16-bit processor constantly monitors the charger's voltage and current. It enables the output when the charger is connected to a Macbook, disables the output when the charger is disconnected, and shuts the charger off if there is a problem. This processor is a Texas Instruments MSP430 microcontroller, roughly as powerful as the processor inside the original Macintosh. The microcontroller circuit board from an 85W Macbook power supply, on top of a quarter. The MPS430 processor monitors the charger's voltage and current. The square orange pads on the right are used to program software into the chip's flash memory during manufacturing. The three-pin chip on the left (IC202) reduces the charger's 16.5 volts to the 3.3 volts required by the processor. 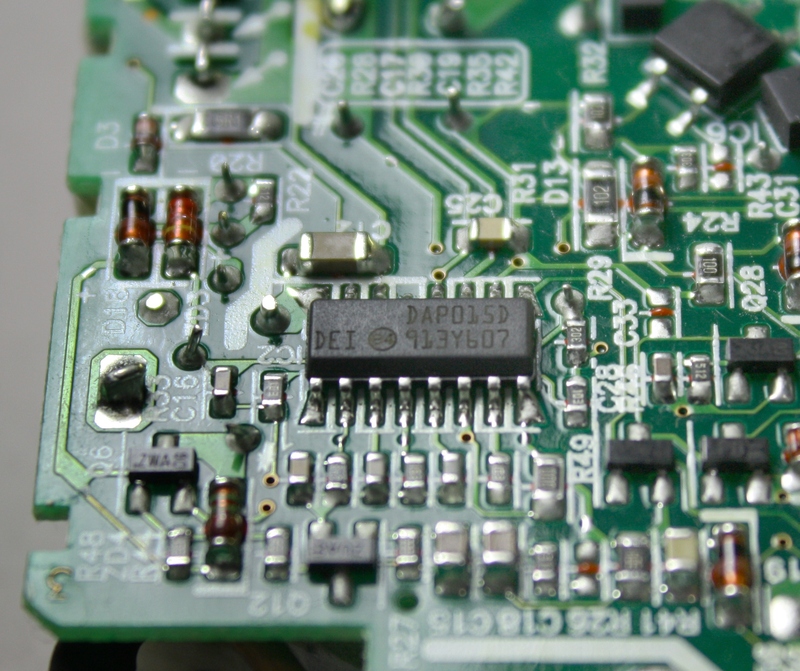 Turning the charger over reveals dozens of tiny components on the circuit board. 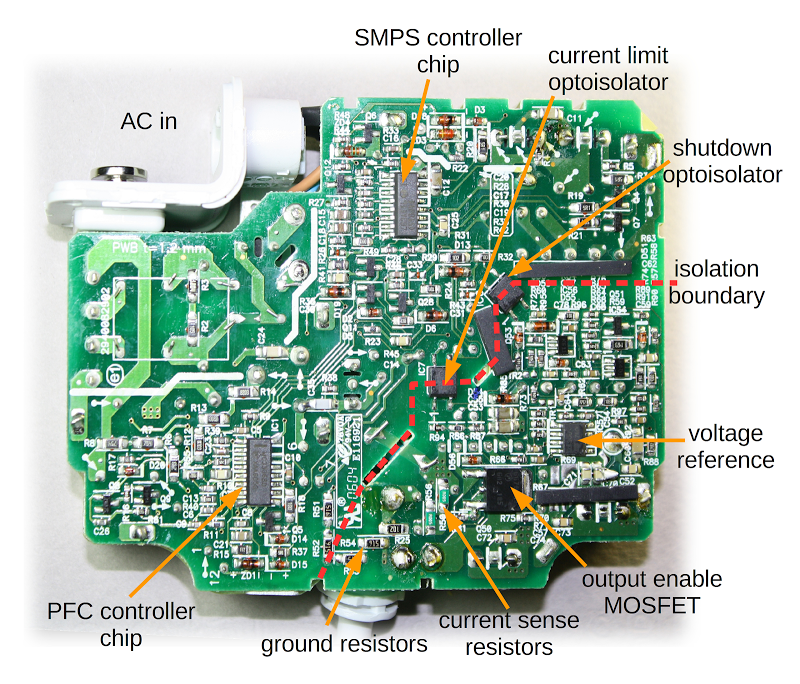 The PFC controller chip and the power supply (SMPS) controller chip are the main integrated circuits controlling the charger. The voltage reference chip is responsible for keeping the voltage stable even as the temperature changes. These chips are surrounded by tiny resistors, capacitors, diodes and other components. The output MOSFET transistor switches the power to the output on and off, as directed by the microcontroller. To the left of it, the current sense resistors measure the current flowing to the laptop. The printed circuit board from an Apple 85W Macbook power supply, showing the tiny components inside the charger. The isolation boundary (marked in red) separates the high voltage circuitry from the low voltage output components for safety. The dashed red line shows the isolation boundary that separates the low-voltage side (bottom right) from the high-voltage side. The optoisolators send control signals from the secondary side to the primary, shutting down the charger if there is a malfunction. One reason the charger has more control components than a typical charger is its variable output voltage. To produce 60 watts, the charger provides 16.5 volts at 3.6 amps. For 85 watts, the voltage increases to 18.5 volts at 4.6 amps. This allows the charger to be compatible with lower-voltage 60 watt chargers, while still providing 85 watts for laptops that can use it. As the current increases above 3.6 amps, the circuit gradually increases the output voltage. If the current increases too much, the charger abruptly shuts down around 90 watts. The magnetic Magsafe connector that plugs into the Macbook is more complex than you would expect. It has five spring-loaded pins (known as Pogo pins) to connect to the laptop. Two pins are power, two pins are ground, and the middle pin is a data connection to the laptop. Inside the Magsafe connector is a tiny chip that informs the laptop of the charger's serial number, type, and power. The laptop uses this data to determine if the charger is valid. This chip also controls the status LEDs. There is no data connection to the charger block itself; the data connection is only with the chip inside the connector. For more details, see my article on the Magsafe connector. The circuit board inside a Magsafe connector is very small. There are two LEDs on each side. The chip is a DS2413 1-Wire switch. You may have noticed that when you plug the connector into a Macbook, it takes a second or two for the LED to light up. During this time, there are complex interactions between the Macbook, the charger, and the Magsafe connector. When the charger is disconnected from the laptop, the output transistor discussed earlier blocks the output power. When the Magsafe connector is plugged into a Macbook, the laptop pulls the power line low. The microcontroller in the charger detects this and after exactly one second enables the power output. The laptop then loads the charger information from the Magsafe connector chip. If all is well, the laptop starts pulling power from the charger and sends a command through the data pin to light the appropriate connector LED. 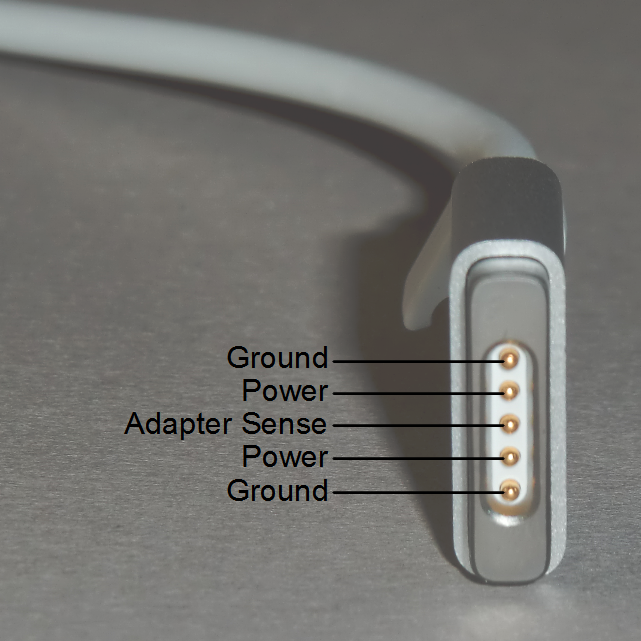 When the Magsafe connector is unplugged from the laptop, the microcontroller detects the loss of current flow and shuts off the power, which also extinguishes the LEDs. You might wonder why the Apple charger has all this complexity. Other laptop chargers simply provide 16 volts and when you plug it in, the computer uses the power. The main reason is for safety, to ensure that power isn't flowing until the connector is firmly attached to the laptop. This minimizes the risk of sparks or arcing while the Magsafe connector is being put into position. The Macbook 85W charger costs $79 from Apple, but for $14 you can get a charger on eBay that looks identical. Do you get anything for the extra $65? I opened up an imitation Macbook charger to see how it compares with the genuine charger. From the outside, the charger looks just like an 85W Apple charger except it lacks the Apple name and logo. But looking inside reveals big differences. The photos below show the genuine Apple charger on the left and the imitation on the right. Inside the Apple 85W Macbook charger (left) vs an imitation charger (right). The genuine charger is crammed full of components, while the imitation has fewer parts. The imitation charger has about half the components of the genuine charger and a lot of blank space on the circuit board. While the genuine Apple charger is crammed full of components, the imitation leaves out a lot of filtering and regulation as well as the entire PFC circuit. The transformer in the imitation charger (big yellow rectangle) is much bulkier than in Apple's charger; the higher frequency of Apple's more advanced resonant converter allows a smaller transformer to be used. The circuit board of the Apple 85W Macbook charger (left) compared with an imitation charger (right). The genuine charger has many more components. Flipping the chargers over and looking at the circuit boards shows the much more complex circuitry of the Apple charger. The imitation charger has just one control IC (in the upper left). since the PFC circuit is omitted entirely. In addition, the control circuits are much less complex and the imitation leaves out the ground connection. The imitation charger is actually better quality than I expected, compared to the awful counterfeit iPad charger and iPhone charger that I examined. The imitation Macbook charger didn't cut every corner possible and uses a moderately complex circuit. The imitation charger pays attention to safety, using insulating tape and keeping low and high voltages widely separated, except for one dangerous assembly error that can be seen below. 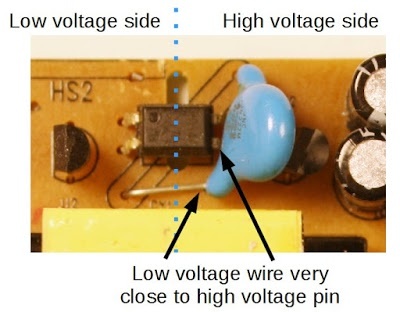 The Y capacitor (blue) was installed crooked, so its connection lead from the low-voltage side ended up dangerously close to a pin on the high-voltage side of the optoisolator (black), creating a risk of shock. Safety hazard inside an imitation Macbook charger. The lead of the Y capacitor is too close to the pin of the optoisolator, causing a risk of shock. The ironic thing about the Apple Macbook charger is that despite its complexity and attention to detail, it's not a reliable charger. When I told people I was doing a charger teardown, I rapidly collected a pile of broken chargers from people who had failed chargers. The charger cable is rather flimsy, leading to a class action lawsuit stating that the power adapter dangerously frays, sparks and prematurely fails to work. Apple provides detailed instructions on how to avoid damaging the wire, but a stronger cable would be a better solution. The result is reviews on the Apple website give the charger a dismal 1.5 out of 5 stars. Burn mark inside an 85W Apple Macbook power supply that failed. Burn marks inside an Apple Macbook charger that malfunctioned. As you can see, the genuine Apple charger has a much more advanced design than the imitation charger and includes more safety features. However, the genuine charger costs $65 more and I doubt the additional components cost more than $10 to $15. Most of the cost of the charger goes into the healthy profit margin that Apple has on their products. Apple has an estimated 45% profit margin on iPhones and chargers are probably even more profitable. Despite this, I don't recommend saving money with a cheap eBay charger due to the safety risk. People don't give much thought to what's inside a charger, but a lot of interesting circuitry is crammed inside. The charger uses advanced techniques such as power factor correction and a resonant switching power supply to produce 85 watts of power in a compact, efficient unit. The Macbook charger is an impressive piece of engineering, even if it's not as reliable as you'd hope. On the other hand, cheap no-name chargers cut corners and often have safety issues, making them risky, both to you and your computer. The main alternative to a switching power supply is a linear power supply, which is much simpler and converts excess voltage to heat. Because of this wasted energy, linear power supplies are only about 60% efficient, compared to about 85% for a switching power supply. 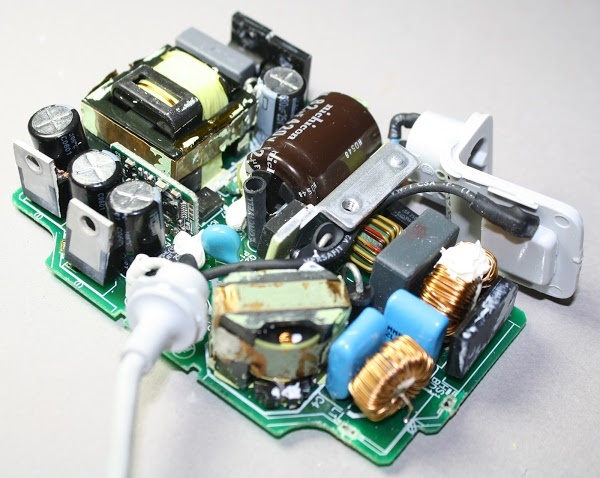 Linear power supplies also use a bulky transformer that may weigh multiple pounds, while switching power supplies can use a tiny high-frequency transformer. Switching power supplies were taking over the computer industry as early as 1971. Electronics World said that companies using switching regulators "read like a 'Who's Who' of the computer industry: IBM, Honeywell, Univac, DEC, Burroughs, and RCA, to name a few". See "The Switching Regulator Power Supply", Electronics World v86 October 1971, p43-47. In 1976, Silicon General introduced SG1524 PWM integrated circuit, which put the control circuitry for a switching power supply on a single chip. The quote about the Apple II power supply is from page 74 of the 2011 book Steve Jobs by Walter Isaacson. It inspired me to write a detailed history of switching power supplies: Apple didn't revolutionize power supplies; new transistors did. Steve Job's quote sounds convincing, but I consider it the reality distortion field in effect. If anyone can take the credit for making switching power supplies an inexpensive everyday product, it is Robert Boschert. He started selling switching power supplies in 1974 for everything from printers and computers to the F-14 fighter plane. See Robert Boschert: A Man Of Many Hats Changes The World Of Power Supplies in Electronic Design. The Apple II's power supply is very similar to the Boschert OL25 flyback power supply but with a patented variation. The idea behind PFC is to use a DC-DC boost converter before the switching power supply itself. The boost converter is carefully controlled so its input current is a sinusoid proportional to the AC waveform. The result is the boost converter looks like a nice resistive load to the power line, and the boost converter supplies steady voltage to the switching power supply components. The charger uses a MC33368 "High Voltage GreenLine Power Factor Controller" chip to run the PFC. The chip is designed for low power, high-density applications so it's a good match for the charger. The SMPS controller chip is a L6599 high-voltage resonant controller; for some reason it is labeled DAP015D. It uses a resonant half-bridge topology; in a half-bridge circuit, two transistors control power through the transformer first one direction and then the other. Common switching power supplies use a PWM (pulse width modulation) controller, which adjusts the time the input is on. The L6599, on the other hand, adjusts the frequency instead of the pulse width. The two transistors alternate switching on for 50% of the time. As the frequency increases above the resonant frequency, the power drops, so controlling the frequency regulates the output voltage. The processor in the charger is a MSP430F2003 ultra low power microcontroller with 1kB of flash and just 128 bytes of RAM. It includes a high-precision 16-bit analog to digital converter. More information is here. The 68000 microprocessor from the original Apple Macintosh and the 430 microcontroller in the charger aren't directly comparable as they have very different designs and instruction sets. But for a rough comparison, the 68000 is a 16/32 bit processor running at 7.8MHz, while the MSP430 is a 16 bit processor running at 16MHz. The Dhrystone benchmark measures 1.4 MIPS (million instructions per second) for the 68000 and much higher performance of 4.6 MIPS for the MSP430. The MSP430 is designed for low power consumption, using about 1% of the power of the 68000. The 60W Macbook charger uses a custom MSP430 processor, but the 85W charger uses a general-purpose processor that needs to loaded with firmware. The chip is programmed with the Spy-Bi-Wire interface, which is TI's two-wire variant of the standard JTAG interface. After programming, a security fuse inside the chip is blown to prevent anyone from reading or modifying the firmware. The voltage to the processor is provided by not by a standard voltage regulator, but a LT1460 precision reference, which outputs 3.3 volts with the exceptionally high accuracy of 0.075%. This seems like overkill to me; this chip is the second-most expensive chip in the charger after the SMPS controller, based on Octopart's prices. The voltage reference chip is unusual, it is a TSM103/A that combines two op amps and a 2.5V reference in a single chip. Semiconductor properties vary widely with temperature, so keeping the voltage stable isn't straightforward. A clever circuit called a bandgap reference cancels out temperature variations; I explain it in detail here. Since some readers are very interested in grounding, I'll give more details. A 1K&ohm; ground resistor connects the AC ground pin to the charger's output ground. (With the 2-pin plug, the AC ground pin is not connected.) Four 9.1M&ohm; resistors connect the internal DC ground to the output ground. Since they cross the isolation boundary, safety is an issue. Their high resistance avoids a shock hazard. In addition, since there are four resistors in series for redundancy, the charger remains safe even if a resistor shorts out somehow. There is also a Y capacitor (680pF, 250V) between the internal ground and output ground; this blue capacitor is on the upper side of the board. A T5A fuse (5 amps) protects the output ground. The power in watts is simply the volts multiplied by the amps. Increasing the voltage is beneficial because it allows higher wattage; the maximum current is limited by the wire size. The control circuitry is fairly complex. The output voltage is monitored by an op amp in the TSM103/A chip which compares it with a reference voltage generated by the same chip. This amplifier sends a feedback signal via an optoisolator to the SMPS control chip on the primary side. If the voltage is too high, the feedback signal lowers the voltage and vice versa. That part is normal for a power supply, but ramping the voltage from 16.5 volts to 18.5 volts is where things get complicated. The output current creates a voltage across the current sense resistors, which have a tiny resistance of 0.005&ohm; each - they are more like wires than resistors. An op amp in the TSM103/A chip amplifies this voltage. This signal goes to tiny TS321 op amp which starts ramping up when the signal corresponds to 4.1A. This signal goes into the previously-described monitoring circuit, increasing the output voltage. The current signal also goes into a tiny TS391 comparator, which sends a signal to the primary through another optoisolator to cut the output voltage. This appears to be a protection circuit if the current gets too high. The circuit board has a few spots where zero-ohm resistors (i.e. jumpers) can be installed to change the op amp's amplification. This allows the amplification to be adjusted for accuracy during manufacture. If you measure the voltage from a Macbook charger, you'll find about six volts instead of the 16.5 volts you'd expect. The reason is the output is deactivated and you're only measuring the voltage through the bypass resistor just below the output transistor. The laptop pulls the charger output low with a 39.41K&ohm; resistor to indicate that it is ready for power. An interesting thing is it won't work to pull the output too low - shorting the output to ground doesn't work. This provides a safety feature. Accidental contact with the pins is unlikely to pull the output to the right level, so the charger is unlikely to energize except when properly connected. The imitation charger uses the Fairchild FAN7602 Green PWM Controller chip, which is more advanced than I expected in a knock-off; I wouldn't have been surprised if it just used a simple transistor oscillator. 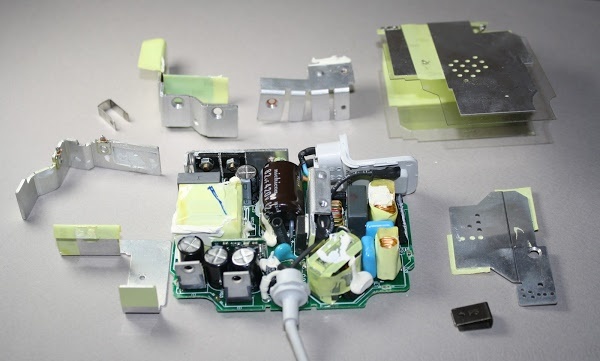 Another thing to note is the imitation charger uses a single-sided circuit board, while the genuine uses a double-sided circuit board, due to the much more complex circuit. 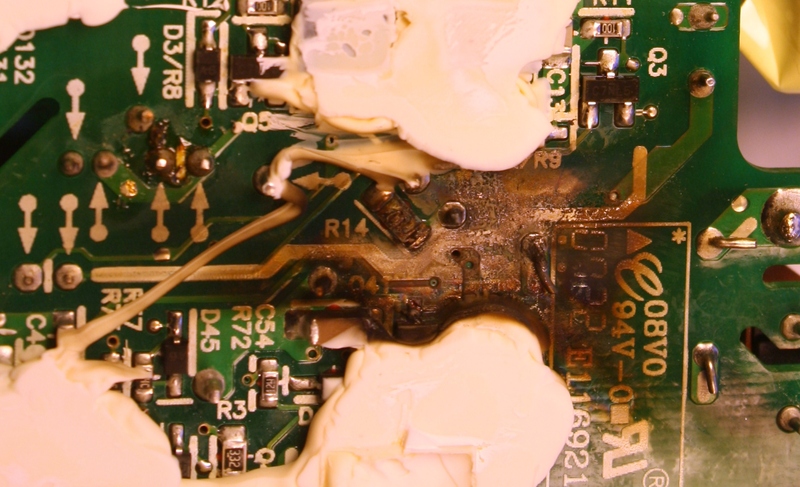 The burnt charger is an Apple A1222 85W Macbook charger, which is a different model from the A1172 charger in the rest of the teardown. The A1222 is in a slightly smaller, square case and has a totally different design based on the NCP 1203 PWM controller chip. Components in the A1222 charger are packed even more tightly than in the A1172 charger. Based on the burnt-up charger, I think they pushed the density a bit too far. I looked up many of the charger components on Octopart to see their prices. Apple's prices should be considerably lower. The charger has many tiny resistors, capacitors and transistors; they cost less than a cent each. The larger power semiconductors, capacitors and inductors cost considerably more. I was surprised that the 16-bit MSP430 processor costs only about $0.45. I estimated the price of the custom transformers. The list below shows the main components. The article Breaking down the full $650 cost of the iPhone 5 describes Apple's profit margins in detail, estimating 45% profit margin on the iPhone. Some people have suggested that Apple's research and development expenses explain the high cost of their chargers, but the math shows R&D costs must be negligible. The book Practical Switching Power Supply Design estimates 9 worker-months to design and perfect a switching power supply, so perhaps $200,000 of engineering cost. More than 20 million Macbooks are sold per year, so the R&D cost per charger would be one cent. Even assuming the Macbook charger requires ten times the development of a standard power supply only increases the cost to 10 cents. I bought one of the original Compaq luggables, must have been about 30 years ago. Not paying attention to the documentation, I had a card containing a Z80 and memory for running CPM software. Compaq published a list of acceptable add-in cards, my CPM card was not on the list. The Compaq power supply went belly up, and I discovered that Compaq wanted about $350 for a replacement, which wasn't standard off-the-shelf. This was ~1985 dollars, a lot more today. I reverse engineered the Compaq power supply, the entire 5 volt system (which powered all of the chips at the time) was supplied by a single 7805 regulator without any additional heat sink. I wasn't going to waste effort repairing the supply, much less waste a ton of money replacing the supply with another terribly designed unit, so I cut off all the mother board power supply connectors and wired in a replacement using a standard PC power supply. My computer worked for several more years, but wasn't portable at all. I never bought another Compaq. @JL If the controller is looking for a zero crossing, like most PFC controllers, it may not work with DC. Great posting. Thanks very much. The LT1460 might be there to lower the noise getting into MSP430F2003 16bit ΔΣ ADC. There will be obviously switching noise from the MCU itself but that is smaller issue at was probably taken into account by the chip designers. 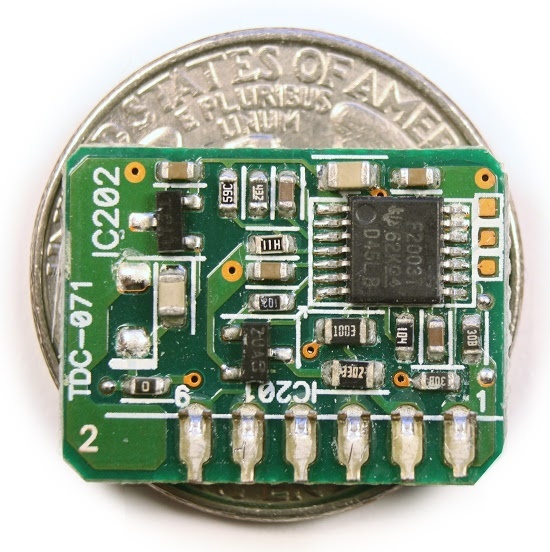 Powering small MCU's that do ADC conversions directly from the voltage references is quite popular. Voltage references can't normally provide high currents to power bigger devices but this one is very low power. As for Apples cable I really don't know what in the hell is wrong with them. The consistently use cables that don't hold up to even mild handling. As much as I like my Apple products, I do have a few, I'm not at all pleased with the cables they supply. Now the interesting question; how dos the third party charger deal with the product verification cycle? Technically , have anyone can give me advice that we should keep charger plug-in when using macbook or plug-out when full-charge? the cord is the weak spot .. they ALL fray, and require the purchase of a new block, and the original heads to the landfill ..
> As for Apples cable I really don't know what in the hell is wrong with them. It has been suggested, though I've seen arguments for and against, that since Apple stopped using PVC in their cables for environmental reasons the cables are more prone to fraying. "The primary chops up the high-voltage DC from the PFC circuit"
"It takes the high voltage DC from the PFC circuit, chops it up and feeds it into the transformer"
I have never heard of a transformer that works in DC because transformers work by the principle of induction right, and induction cannot transfer energy to the secondary coil from primary unless there's change of flux in primary. Power factor correction is also a term that's related to AC, never heard it being used in DC. Some old components in there - the MSP430 is date-coded Feb 2006, and the SMPS chip looks like wk 13 2009. The chopping of the DC converts it to AC, though a lot closer to a square wave than a sine wave. That gives you the change of flux that makes the transformer work. The Wikipedia article at https://en.m.wikipedia.org/wiki/Chopper_(electronics) may be instructive here. PFC has to do with the load presented to the power line by the charger: whether the voltage leads or lags the current. This is pure AC, with no DC involved. Wikipedia again is useful: https://en.m.wikipedia.org/wiki/Power_factor , with special attention to the section on switched-moore power supplies. Very good teardown! I work as engineer and use the same L6599 CI, What suprise for me that Apple use the same. The cost of a LLC transformer is about $1,50 and the PFC inductor is $1,25. Great article. Does the unbranded charger provide a good value? Does it do the job? Will it harm my Mac? Great article! Thank you very much. Now I know why my MacBook Air actually has ruined power connector. I was using a cheap power supply after the original Apple one broke. After a while I realized that the MBA would not charge anymore and checked the socket on the MBA. I noticed that it had black burn marks and also partially melted plastic. I assume those stem from sparks and arcs during plugging and unplugging of the non-apple power adapter. That probably didn't had the safety feature to only turn on power if the connection is firmly established. 38 years and counting of copying what's already successful and telling the world that it's revolutionary and they invented it. Very interesting! Perhaps you or someone reading can help with my problem with the Apple charger ... it just falls out of the socket. Does anyone else have this problem or know of a solution? Here's a short video I tweeted to @tim_cook but no reply yet. Great teardown! I'm curious if someone with a real EE background could explain why the voltage is different and has to be negotiated between the 65W and the 80W-powered laptops. My reading of the specification of the MacBook/MBPro is that they accept a range of different voltages. Wouldn't it make sense to just standardize on one voltage (e.g. 18v)? I've been powering my MBP from a hobby 4s LiPo battery and it seems to work fine. Still can't find what the highest input voltage is for the MBP which is quite an annoyance. Some sites say 22v, others 25v. 1) The outer conductor is aluminum, which work hardens and gets brittle over time, especially when the outer insulation layer gets stiffer. I think this is why the newer cables are even more problematic than the older ones. 2) People aren't very good about not pulling on their cables and wrapping them tightly around corners. This is a particular problem right at the connection points on both ends. Bottom line: Apple would be well served to move away from the 'pretty' round coax able design and move to a flat design with more and thinner conductors, so that the strain between the outer side and inner side was reduced when going around sharper corners. Adding cable connectors so that the cable is replaceable, not just the whole charger, would also help. Ditto an earlier comment - I read a little further after claiming to feed DC voltage to a transformer and then stopped. Perhaps the author is lazy about terminology and there is a DC-to-DC converter rather than a transformer or that the DC isn't really DC but a chopped sine wave, but either way as written I have zero trust other liberties weren't taken with the 'explanation'. Will find a better teardown somewhere else.
" The laptop pulls the charger output low with a 39.41KΩ resistor to indicate that it is ready for power." So, if I put 39.41KΩ resistor as a load can I get some amps out from this charger to my laptop? (If I leave magsafe connector in cable and get voltage out from cable with different connector)? Article mentions that 39.41KΩ resistor should be correct to get charger active ? Has anyone try this ? Jeremy: I believe the issue with the voltage negotiation is backwards compatibility for old Macbooks are expecting the lower voltage. 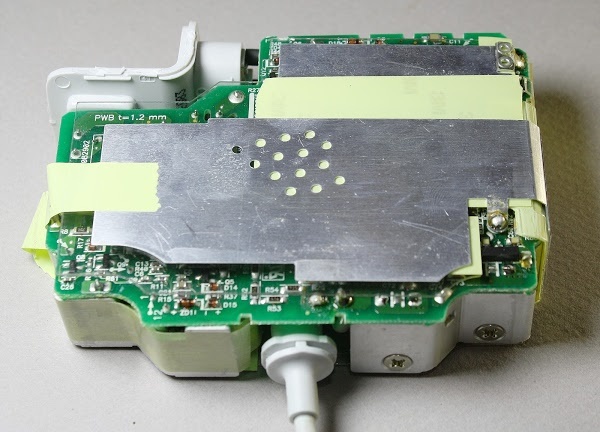 Apple wanted to move to higher voltages but older laptops weren't designed for it. The negotiation lets the power supply handle both types. 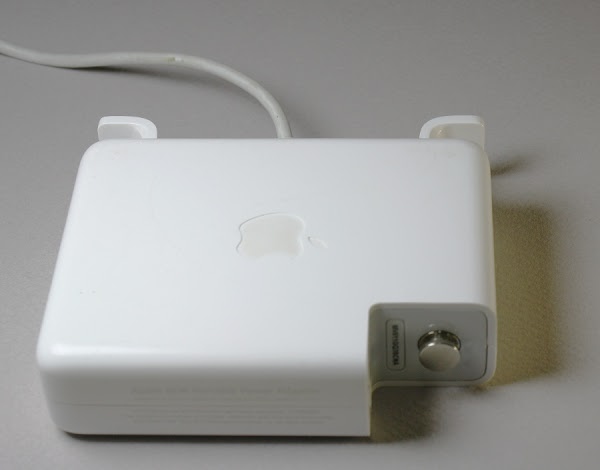 Apple gave up on supporting older Macbooks with the Magsafe 2 connector. This is why you can get an adapter to use an old charger with a Magsafe 2 laptop, but not vice versa. DC Anonymous: you're missing the point of a resonant converter. Switching power supplies normally chop up the DC into pulses, which are fed into the transformer. (Obviously steady DC won't work in a transformer.) The resonant controller is a bit more advanced, using a half-bridge configuration to send out-of-phase DC pulses. With the resonant converter, these pulses resonate in the LLC circuit and approximate a sine wave, allowing better switching. I refer you to the L6599 datasheet for details. 39.41K Anonymous: yes, if you put a 39.41K resistor as load for one second, you can get power out of your charger. The tricky part is you can only get about 5mW through such a large resistance (which is by design). If you want to get a practical current, you need to swap in a lower resistance when the voltage jumps up. This does work - I can do it by hand about 1/3 of the time. If you don't get the timing right, the power supply will shut back down and you need to try again. Putting an oscilloscope across the output will make it clearer what is happening. The resistance doesn't need to be exactly 39.41K; a 10% resistor works fine for me. Indeed, the MC33368 shouldn't do anything when the charger is fed with DC -- it does look for a zero-cross to start boosting the voltage, and is also powered partially from a winding on the PFC inductor. However, this simply means that the unboosted DC input goes straight to the resonant converter minus the boost diode's drop, as the switch in a boost converter is in parallel with the load. Hello! Thank you for this post! I know that it is widespread problem od such devices. i want ot get your consultation. Please, tell me: if I want to plug in this model http://hardware.nl/power-supply/dell/k2583.html, is it possoble to make with macbook? I afraid to try to do it without any consultations. I will be very thankful for your answer! Nice article! Came here looking for a way to find the cause of failure of my 85W apple power adaptor (A1424). The DC output voltage is only 1mv. There seem to be no other obvious problems with the unit (caps look ok visually, no burn marks/smell etc. )..Would appreciate some tips..
Getting the board out appears quite tricky so I was wondering if I can piece together a simple schematic/pinout from your photos. Thanks! The two metal shields with perforations are likely for EMI reduction. Only the thicker shield without perforation is a heat sink. Using a hobby LiPo is a pretty bad idea as if you get the voltage too low then the pack is dead and they need specialist LiPo charging. You are really taking a serious risk not using a dedicated LiPo charger. For the higher wattage, either the voltage or the current needs to increase (Ohms Law) to get the higher watts. Increasing the current would increase the resistance (and heat) in such thin cables so increasing the voltage is a sensible solution. Would like to see a similar tear down and analysis of a high quality desktop PSU, like an EVGA gold rated 800 watt psu or similar. No wonder they go wrong so often-- talk about over-engineering. I worked in Europe for a well known lighting company, and for a while I was involved in the compact fluorescent lamps: these have power rectification circuitry from mains voltage, which may be used in circumstances of high temperature, since the lamps may be enclosed in and "upside down" installations. Gets hot. These circuits are called drivers. Apart from safety features, a good one does clever things like prewarming the cathode before the lamp turns on, to help it last many more switching cycles, and of course it has to avoid polluting the power supply since in some applications there are many of them on the same phase. But that costs money. When our first efforts to source circuits from China began, many suppliers were visited. One of them had a great cost saving method: take the driver from a traditional supplier's lamp, and one by one remove components until the driver failed. Nice teardown. I am in the process of assembling & building my own very clean (quality/filtered) power supply for my mobile requirements (going direct DC to DC) and was thinking a pure 20v was all that was needed. Go figure this is a little more complicated. The board & chip I'll be using is really efficient (expected 95%-99% always) and so should not waste power when the current draw is low (say when my 15" MBP is fully charged), but that also assumes the MBP won't waste the 20v provided and just draw more current because it can? Does anyone have the answer to that? Should it really drop the voltage some so logic in the MBP does not waste power? Ken, the separation between high and low power sections is not detailed enough here for me to know the answer, but in your hands on experience with dissecting this or any apple charger and based of your one comment above, do you think it possible to cleanly add a tap into the low power portion (bypass the transformer process) and supply a base/clean DC voltage to the board? My hope is to repurpose my latest or perhaps an older 85w charger and to replicate exactly what apple does by using all their logic after the basic AD-DC transformer stage, and not just the connector. Has anyone you know of done this? Just tore apart a charger that died shortly after purchase. Does this look counterfeit? Might be hard to tell because they glopped glue all over and inbetween the internals. asdf: the charger in your photograph looks counterfeit. The genuine Apple chargers have many, many more components; compare with your third photo. Why do you say Steve Jobs' quote about Ron Holt is "entirely false"? The only part about that quote that may (may!) be less than true is the last part: "they all rip off Rod Holt's design." I'm very disappointed with macbook charger (magsafe 2 60W). I bought it with the macbook more than 2 years ago and last month my daughter accidentally dropped the charger on the floor. since then I can use the charger anymore because it always cause the wall main power turned down/tripped. it seems the charger shorted. At first I suspect there was something wrong with the cable output from the charger to macbook port. I tried to disassemble it and remove the cable from the charger board. then plug in the charger to the main power but it still make the main power turned down. now i think the problem is on the charger board but not sure about the components on the board. Would it be possible to get a apple Mac book pro 2015 running off 12 volts? Would it be possible after opening up the mains charger to inject a D.C voltage say using a variable voltage doubler to provide the 16.5 or 18volts? I have a pure sinewave inverter but i think it is probably more efficient to use 12volts directly if possible. Could I ask two questions about MSP430 here? Please forgive me if it's not suitable. Hi Agd Fadjd. The MSP430 uses its own assembly language (i.e. it's just called MSP430 assembly language) The MSP430 User's Guide explains the instruction set in detail. The MSP430 Assembly Language Tools manual goes into details on the syntax. The manual for your specific chip should describe the available peripherals and their addresses. Texas Instruments has a MSP430 forum, which would be a good place for additional questions. is it possibile to use MagSafe with a UPS with an approximate sine wave output (NOT a pure sine wave) ? Any problem to the mac with this combination ? Hi Ken thanks for sharing your work. With A1222 You confirmed with (15) that indeed it shows only 6V when tested with multimeter. You saved me from having to open the big shell. My problem exists in the Mag safe connector end. Does anyone know what is the value of fusible resistor (next to big cap) as seen on the post image? * where _ represent unreadable characters. I wish I had read your article before I tore apart my Magsafe II charger, trying to find what's wrong with it, as my voltmeter measured 0.0 to 0.6V output voltage! Nothing was wrong with it, actually. It was not activated due to lack of proper load. Details (and possibly pictures) on a following comment, after finishing my tests (I am currently writing this on a MacBook pro 2010 using this "hacked" magsafe charger). Hmm, is there anyone out there who repairs the damaged cord on a MacBook charger, maybe with something more sturdy? Thanks for the excellent article! I was surprised to see how complex is the circuitry of the Apple charger. @Stratis Georgiou: I would love to see your solution, esp. the full activation part. Are you going to share this here? Thank you for this helpful article! There is no output DC between the white and the black wires on the board. I couldn't see any damage on the components. What could be failing? I measure 120V AC input, but nothing on output. Sometimes if dropped the older macbook chargers would suffer a shock which could break one of the legs of a coil, you could re-connect a new leg to the coil and it worked again. The comment on the low voltage on the output of the magsafe adapters was priceless! I thought my chargers were dead and would need caps or optocoupler changing but i simply fitted the new cables and they work fine. Note. Some of the cables on ebay are not as good as others. I bought some of the rectangular ones and some of the cylindrical ones and the rectangular ones had better quality cable and insulation around the negative plus it had the correct strain relief grommet, the other had no grommet.